Wishwood Slot is 20 paylines and 5 reels online video slot game presented by IGT software platform. This is one of the latest video slot games from the makers of IGT. You can play Wishwood Slot with the help of your mobile phones, Desktop or either by using you tables with coin sizes of 20p to €£400 per spin at any of the given IGT online casinos. This slot offers a jackpot of whooping 10,000 times of your total bet plus there are 6 bonus rounds available in this game like free spins (5 to 24) and up to 10x multipliers. 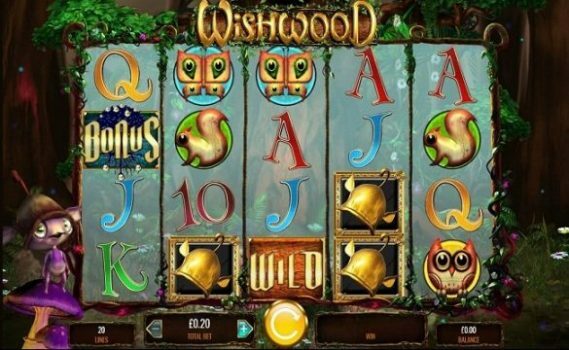 Wishwood Slot is a mystical slot game which features many different kinds of mystery features in it such as wispy wilds, magic multipliers and tangled symbols. There is a magical tree in the background of this slot to which a player can climb and could get access to 1 to 3 free spins feature. The symbols of this mystery themed slot game are A, K, Q, J and 10 playing cards and some other symbols like owls, golden acorns, butterflies and squirrels. The wild symbol in this slot game can replace all other symbols and it is one of the most lucrative symbols of this game, which would offer you 500 times of your total stake for 5 wild symbols across a payline. There are plenty of great bonus features available in this slot game. The first one if Wispy Wilds feature and during this feature up to 4 wild symbols can appear in random positions on the reels, which means a huge win can be possible during the game. The next bonus feature of this game is Magic Multipliers feature. In this bonus feature 3 to 4 multipliers will appear between the reels and then they will form a great winning combination for a player. The Tangled Symbols feature is the feature which can be triggered randomly during base game. It forms winning combinations. 1:- The first stage of Bonus climb is Amber Wilds, which would be sticky wilds during the free spins. 2:- The second stage is Enchanted Wild Bonus and in this stage you will collect wisp symbols and your spins will be upgraded to more wild symbols. 3:- The third stage is to climb on the top of the tree and it is known as Top of the Tree bonus, which would offer you 8 free spins. This could allow you to get 100 times of your total stake.